Gone are the days where green striped, crank awnings were the only retractable options for shade. The new Salerno Retractable Awning transforms a patio space into a bonus "room". With permanent, sleek frame posts in place and options for sheer curtains, panel doors and more, this previous transition from the home to the yard has now become a place fit for morning coffee, mid-day luncheons, afternoon cocktails and evening affairs. What I love most about the awnings, especially for my northeast clients, is the versatility and longevity they give to their outdoor space. 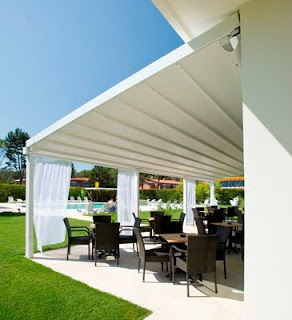 Not to mention the cool, sleek, upscale feel you get beneath the crisp white awning paired with flowing pure white sheers. A private paradise right in your own backyard.